Do NoSQL databases make consistency too hard? I’ve spent the last couple of weeks trying to figure out how to design a fairly large system that needs to deal with hundreds of millions of objects and tens of thousands of transactions per second (both reads and writes). That kind of throughput is hard to do with a traditional RDBMS, although there are apparently some people that manage. The problem is those tricks seem to be very much about getting amazing performance out of single database nodes, and of course, if you run out of tricks when the load increases, you’re screwed. What I’m looking for is something that is more or less guaranteed to scale. In this particular case, availability and partition-tolerance are not very important as such, but consistency and scalable throughput are, as is the ability to recover reasonably quickly from disasters. Scalability and throughput is what you get from NoSQL systems, so that would seem to be the way to go. Automatically using some version of ‘last writer wins’, perhaps augmented using vector clocks or something similar to increase the likelihood of being correct. This is only a likelihood, though, and at least for our current case, this is insufficient. Let readers resolve conflicts by giving them multiple versions of the data, if there have been conflicts (this is how Amazon’s Dynamo works, by the way). Make it possible for writers to resolve conflicts by presenting them with the current versions in case there are conflicts, or using something like a conditional put. Separate the system into two layers, a scale-agnostic business layer that knows how to process messages, but is completely and utterly unaware of the scale at which the system is running, and a scale-aware layer that has no idea what business logic is executed but that knows how many nodes are running and how data is distributed across the different nodes. Ensure that all business-level events triggered by messages are Associative, Commutative and Idempotent (adding Distributed into the mix, he calls this ACID2.0, I’ll use ACI for the first three letters from now on). This means that if two nodes have seen the same messages, they will have the same view of the world, irrespective of the order in which they arrive, and whether they received one or more copies of a particular message. Ensure that the scale-aware layer guarantees at-least once delivery of messages. That is, a sender can rely on the fact that a message will always arrive at the right destination, even in the face of failures, repartitioning of data, etc. The only way to do that is to occasionally have messages arrive more than once. With a system that follows those principles, conflicts don’t happen, so you don’t need to resolve them. Think about that for a second – associativity and commutativity means that message processing is order-independent. Idempotence means that if you receive the same message twice, the second time has no effect. This means that any differences in world-view (that is, data stored locally) between two different nodes will always be resolved as soon as they have seen the same set of messages, which is essentially the definition of eventually consistent. At-least-once message delivery guarantees that all nodes that should receive a certain message will do so, sooner or later. The key difference between Pat Helland’s architecture and today’s NoSQL solutions is the level at which world-view coordination is done. As far as I can understand, all current NoSQL systems coordinate at the data level by making sure that bits and bytes are propagated to the right receivers in the clusters. The problem is that once those bits and bytes differ, it is very hard to understand why they differ and what to do about the conflict. There’s no generic way, at the data level, to make messages ACI, but it can be done at the business logic level. The data-replicating systems don’t and can’t realistically preserve the business-level events that led to the changes in data. 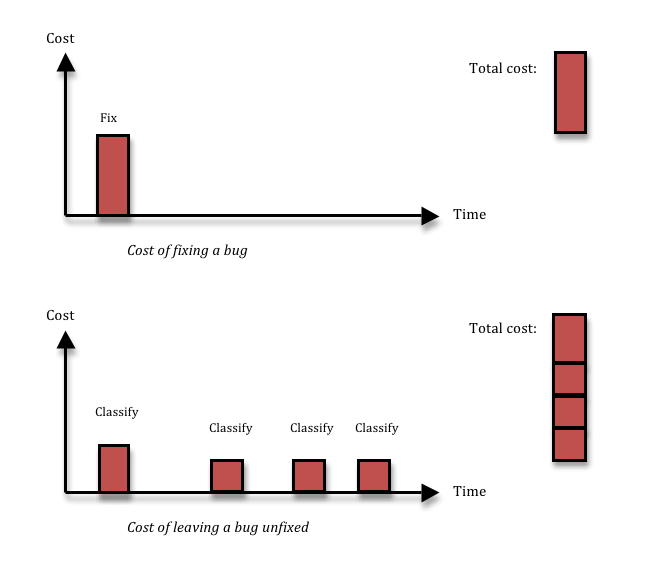 Fixing a bug means you incur a cost, and that’s the reason why people want to avoid fixing bugs that aren’t important. Cost-cutting is a great thing. The problem is, not fixing a bug also has a cost. If you decide to leave some inconsequential thing broken in your system, most likely, you’ll run into the same thing again three months down the line, by which time you’ll have forgotten that you had ever seen it before. Or, equally likely, somebody else will run into it next week. Each time somebody finds the thing again, you’ll waste a couple of hours on figuring out what it is, reporting it, classifying and prioritising it, realising it’s a dupe, and then forgetting about it again. Given enough time, that long term cost is going to be larger than the upfront fixing cost that you avoided. 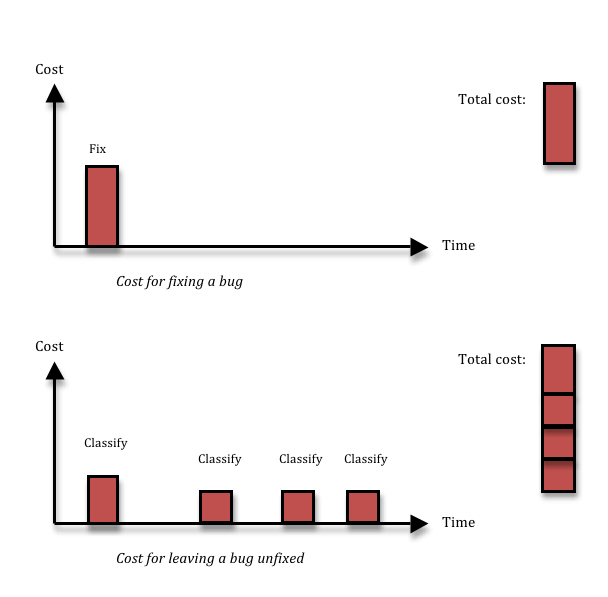 What’s more, just having a process for prioritising bugs is far from free. Usually, you will want the person who does the prioritisation to be a business guy rather than a QA or development guy. Maybe the product owner, if you’re doing Scrum. That means that for every bug, she will have to stop what she is doing, switch contexts and understand the bug. She will want to understand from a developer if it is easy or hard to fix, and she will want to assess the business cost of leaving it unfixed. Then she can select a priority and add it to the queue of bugs that should be fixed. In the mean time, work on the story where the bug was found is stalled, so the QA and developer might have to context switch as well, and do some work on something else for a while – chances are the product owner won’t be available to prioritise bugs at a moment’s notice. Instead, she might be doing that once per day or even less frequently. All this leads to costly context switching, additional communication and waiting time. The solution I advocate is simple: don’t waste time talking about bugs, just fix them. The majority of bugs can be fixed in 1-5 hours (depending of course on the quality of your code structure). Just having a bug prioritisation process will almost certainly take 1-3 man-hours per bug, since it involves many people and these people need to find the time to talk together so that they all understand enough about the problem. The cost might be even larger if you take context switching and stall times due to slow decision-making into account. And if you add the cost of having to deal with duplicate bugs over time, it’s very hard to argue that you will save anything by not fixing a bug. There are exceptions, of course. First, time is a factor; the decision not to fix will always be cost effective from a very short perspective, and always wasteful from a very long perspective. 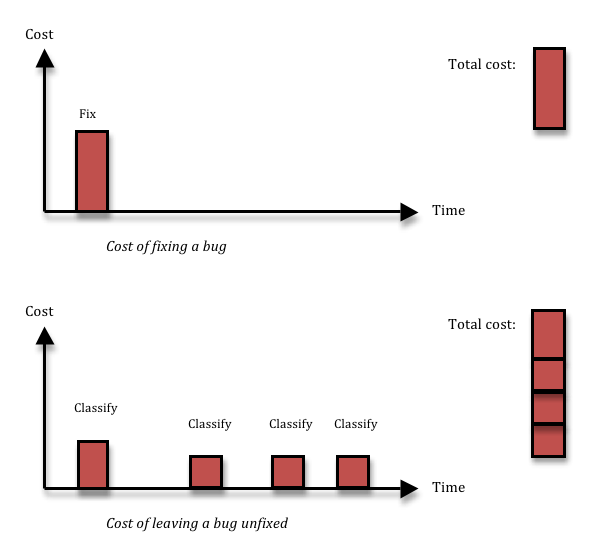 Second, the harder the bug is to fix, and the less likely it is to happen, the less likely is it that you’ll recover the up-front cost of fixing the bug by avoiding long-term costs due to the bug recurring. I think it should be up to the developer whose job it is to fix the bug to raise his hand if it looks likely to fit into the hard-to-fix-and-unlikely-to-happen category. My experience tells me that less than 5% of all bugs fit into this bucket – I just had a look at the last 40 bugs opened in my current project, and none of those belonged there. Anyway, for those bugs, you will need to make a more careful decision, so you need the cost of a prioritisation process. That means you can reduce the number of bugs you have to prioritise by a factor 20, or perhaps more. Lots less context-switching and administration in the short perspective, and lots less duplicated bug classification work in the longer perspective. Note that the arguments I’m using are completely independent of the cost of the bug in terms of product quality. I’m just talking about development team productivity, not how end users react to the bug. I was in a discussion the other day with some former colleagues who were complaining that the people in charge of the business didn’t allow them to fix bugs. But the arguments they had been using were all in terms of product quality. That is something that (rightly, I think) tends to make business people suspicious. We as engineers want to make ‘good stuff’. Good quality code that we can be proud of. But the connection between our pride in our work and the company’s bottom line is very tenuous – not nonexistent, but weak. I want to be proud of what I do, and what’s more, I spend almost all of my time immersed in our technical solutions. This gives me a strong bias towards thinking that technical problems are important. A smart business person knows this and takes this into account when weighing any statement I make. But to me, the best argument in favour of fixing almost all bugs without a bug prioritisation process only looks at the team’s productivity. You don’t need the product quality aspect, although product quality and end-user experience is of course an additional reason to fix virtually all bugs. So, it is true that there are cases when you want to hold off fixing a bug, or even decide to leave it in the system unfixed. But those cases are very rare. In general, if you want to be an effective software development team, don’t make it so complicated. Don’t prioritise bugs. If it’s broken, fix it. You’ll be developing stuff faster and as an added bonus, your users will get a better quality system. Lately, I’ve found myself disagreeing with such giants as Trygve Reenskaug and Tony Hoare, and thinking that I have understood something about software that maybe they have not. A nobody disagreeing with two famous professors! Can I have a point? Well, read on and make up your own mind about it. This is a lovely and memorable quote, but as all soundbites, it is a simplification. In fact, I think it is simplified to the point of not being meaningful, and while I think that Trygve’s point about testing is correct, I also think it is not very important and a slightly dangerous point to make as it might discourage you from testing. Tests, especially automated ones, are critical when building quality software, even though they don’t put quality into the product. Let me start on why I don’t think Tony Hoare’s quote is great with two code examples. This code is simple, to the point where it obviously contains no deficiencies. It’s not particularly interesting, but a glance shows that it does what you’d expect it to. One point to Tony! It does monetary calculations using floating-point arithmetic. This means that calculations aren’t exact, and exactness is always a requirement when dealing with money (see for instance Effective Java, Item 48 for more on this). It is probably broken in more subtle ways as well. In Sweden, the default VAT rate is indeed 25% on top of the price before VAT. But most of the time, people in Sweden think about this backwards – the only price they see is the one with VAT, so some people prefer to multiply the total price by .2 to get the part of the total price that is VAT. We don’t know if the amount is the amount before VAT or the total amount including VAT. Also, the VAT rate depends on the item type, so if this method were called using the price of a pencil, it would probably give the right answer, but it wouldn’t for a book. And if the amount is the total of an order for a pencil and a book, it’s wrong in yet another way. The list of things that could be broken in terms of how to do VAT calculations goes on. And the funny thing is, from a machine-instructions perspective, the two classes are of course identical! Why is the first one right, and the second one wrong, just because we changed some names? When the names changed, our perception of the programmer’s intent changed with them. Suddenly, the identical machine instructions have a more specific purpose, and we see more of the actual or probable business rules that should be applied. This makes the second version obviously broken because it uses floating-point arithmetic for monetary calculations. We understand enough about the programmer’s intent to find a mistake. But while the floating-point error is obvious, there is nothing in the code that gives us clear evidence as to whether the VAT calculation is correct in terms of the rate that is being applied or not. Clearly, readability is not sufficient to guarantee correctness. Correct code meets its business requirements – the intent of the person who uses it for something. Readability can at best tell us if it meets the intent of the programmer that wrote it. This doesn’t mean readability is unimportant; on the contrary, readable code is a holy grail to be strived for at almost all cost. But it does mean that Tony Hoare’s goal is unachievable. The code by itself cannot “obviously have no deficiencies”, because the code only tells us what it does, not what it should do. So how can we ensure that our code is correct? Well, we need well-defined requirements and the ability to match those requirements with what the code does. There are people whose full-time job is to define requirements; all they do is to formulate business users’ descriptions of what they do in terms that should be unambiguous, free of duplication, conflicts, and so on, so that programmers and testers can get a clear picture of what the code should actually be doing. There are whole toolsets for requirements analysis and management that help these people produce consistent and unambiguous definitions of requirements. Once that’s done the problem is of course that it’s really hard to know if your code actually meet all the requirements that are defined. No problem, there’s further tools and processes that support mapping the requirements to test cases, executions of these test cases and the defects found and fixed. Like many others (this is at the heart of agile), I think all that is largely a waste of time. I’m not saying it doesn’t help, it’s just very inefficient. It’s practically impossible to formulate anything using natural language in a way that is unambiguous, consistent and understandable. And then mapping requirements defined using natural language to tests and test executions is again hard to the point of being impossible. The only languages we have that allow us to formulate statements unambiguously and with precision are formal systems such as programming languages. But wait, did I just say we can write something that has no ambiguity in code? Could we formulate our requirements using code? Yes, of course. Done right, that’s exactly what automated tests are. If our automated tests reflect the intent of the users of the code, we can get an extremely detailed and precise specification of the requirements that has practically zero cost of verification. Since the specification is written in a programming language, it is written using one of the best tools we know how to design in terms of optimal unambiguity and readability. As we all know, programming languages have shortcomings there, but they are way superior to natural language. The argument that business users won’t be able to understand tests/requirements written in code and that they therefore must be in natural language is easy to refute on two grounds: first, business users don’t understand a Word document or database with hundreds or thousands of requirements either (and neither do programmers), and second, let the code speak for itself. Business users can and do understand what your product does, and if it does the wrong thing, they can tell you. Fix the code (tests first), and ship a new version. Again, a core principle in agile. I often come across a sentiment among developers that tests are restrictive (“I’ve fixed the code, why do I have to fix the test too”), or that you “haven’t got the time to write tests”. That’s a misunderstanding – done right, tests are liberating and save time. Liberating, because the fact that your tests specify how the code is intended to behave means that you don’t need to worry as much about breaking existing functionality. That enables you to have multiple teams co-owning the same code, which improves your agility. Maybe even more importantly, having a robust harness of tests around some code enables you to refactor it and thereby keep the code readable even in the face of evolution of the feature set it must support. So that should hopefully explain why I think the point that Trygve made about tests not being able to get quality into a product is valid but not really important. The quality comes from the clarity of the system architecture, system design and code implementation, not from the tests. But automated tests enable you to keep quality in a product as it evolves by preventing regression errors and making it possible for you to keep the all-important clarity and readability up to date even as the code evolves. A couple of recent events made me see the value of company-internal standardisation in a way that I hadn’t before. Obviously, reusing standardised solutions for software development is a good thing, as it is easier to understand them. But I’ve always rated continuous evolution of your technologies and choosing the best tool for the problem at hand higher. I’m beginning to think that was wrong, and that company-internal standards are or can be a very important consideration when choosing solutions. This meant it was trivial to get Hudson to run these tests for us against the staging environment and that both developers and QA can run the tests at any time. The second example is also related to automated testing – we’ve started creating a new framework for managing our performance tests. We’ve come to the conclusion that our team in the EU has different needs to the team in the US that maintains our current framework, and in the interest of perfect agility, we should be able to improve our productivity by owning the tools we work with. We just deployed the first couple of versions of that tool, and our QA Lead immediately told me that he felt that even though the tool is still far inferior to the one it will eventually replace, he was really happy to have a plain Java service to deploy as opposed to the current Perl/CGI-based framework. Since Java services are our bread and butter at Shopzilla (I’ve lost count, but our systems probably include about 30-50 services, most of which are written in Java and use almost RESTful HTTP+XML APIs), we have great tools that support automated deployment and monitoring of these services. The final example was a program for batch processing of files that we need for a new feature. Our initial solution was a plain Java executable that monitored a set of directories for files to process. However, it quickly became obvious that we didn’t know how to deal with that from a configuration management/system operations perspective. So even though the development and QA was done, and the program worked, we decided to refit it as one of our standard Java services, with a feature to upload files via POST requests instead of monitoring directories. We’ve invested a lot in creating tools and processes around managing Java services that are deployed as WARs into Tomcat. Doing that is dead easy for us. We get a lot of common features for free when reusing this deployment form: standard solutions for setting server-specific configuration parameters, logging, load balancing, debugging, build numbers, etc. Every single person working here is familiar with our standard Java/Tomcat services. Developers know where to find the source code and where the entry points are. QA knows where to find log files, how to deploy builds for testing and how to check the current configuration. CM knows how to configure environments and how to set up monitoring tools, and so on. I think there is a tendency among developers – certainly with me – to think only about their own part when choosing the tools and technologies for developing something new. So if I would be an expert in, say, Ruby on Rails, it would probably be very easy for me to create some kind of database admin tool using that. But everybody else would struggle with figuring out how to deal with it – where can I find the logs, how do I build it, how is it deployed and how do I set up monitoring? There is definitely a tradeoff to be made between being productive today with existing tools and technologies and being productive tomorrow through migrating to newer and better ones. I think I’ve not had enough understanding of how much smoother the path can be if you stay with the standard solutions compared to introducing new technologies. My preference has always been to do gradual, almost continuous migration to newer tools and technologies, to the point of having that as an explicit strategy at Jadestone a few years ago. I am now beginning to think it’s quite possible that it is better to do technology migrations as larger, more discrete events where a whole ecosystem is changed or created at the same time. In the three cases above, we’re staying on old, familiar territory. That’s the path of least resistance and most bang for the buck. I recently posted some thoughts about DCI and although I mostly thought it was great, I had two points of criticism in how it was presented: first, that using static class composition was broken from a layering perspective and second, that it seemed like class composition in general could be replaced by dependency injection. Despite getting a fair amount of feedback on the post, I never felt that those claims were properly refuted, which I took as an indication that I was probably right. But, although I felt and still feel confident that I am right about the claim about static class composition and layering, I was and am less sure about the second one. There was this distinction being made between class-oriented and object-oriented programming that I wasn’t sure I understood. So I decided to follow James Coplien’s advice that I should read up on Trygve Reenskaug’s work in addition to his own. Maybe that way I could understand if there was a more subtle distinction between objects and classes than the one I called trivial in my post. Having done that, my conclusion is that I had already understood about objects, and the distinction is indeed that which I called trivial. So no epiphany there. But what was great was that I did understand two new things. The first was something that Jodi Moran, a former colleague, mentioned more or less in passing. She said something like “DI (Dependency Injection) is of course useful as it separates the way you wire up your objects from the logic that they implement”. I had to file that away for future reference as I only understood it partially at the time – it sounded right, but what, exactly, were the benefits of separating out the object graph configuration from the business logic? Now, two years down the line, and thanks to DCI, I think I fully get what she meant, and I even think I can explain it. The second new thing I understood was that there is a benefit of injecting algorithms into objects (DCI proper) as opposed to injecting objects into algorithms (DCI/DI). Let’s start with the point about separating your wiring up code from your business logic. In the US, VAT is based on the state where you send stuff from, and Wisconsin applies the same flat VAT rate to any item that is sold. In Sweden, there are two different VAT rates: one for books, and another for anything else. In Poland, some items incur a special “luxury goods VAT” in addition to the regular VAT. These two taxes need to be tracked in different accounts in the bookkeeping, so must be different posts in the order. VAT calculations in the above countries may or may not work a little bit like that, but that’s not very relevant. The point is just to introduce some realistic complexity into the business logic. Right – armed with this example, let’s see how we can implement it without DI, with traditional DI and with DCI/DI. The same classes that implement the business logic also instantiate their collaborators, and the VatCalculatorImpl accesses a singleton implemented using a public static method (GlobalConfig). Only leaf nodes (yes, the use of the term ‘leaf’ is sloppy when talking about a directed graph – ‘sinks’ is probably more correct) are unit testable in practice. So while it’s easy to instantiate and test the PolandVAT class, instantiating a VatCalculator forces the instantiation of four other classes: all the VAT implementations plus the GlobalConfig, which makes testing awkward. Nobody describes these problems better than Miško Hevery, see for instance this post. Oh, and unit testing is essential not primarily as a quality improvement measure, but for productivity and as a way to enable many teams to work on the same code. As Trygve Reenskaug describes, it is in practice impossible to look at the code and figure out how objects are interconnected. Nowhere in the OrderProcessor is there any indication that it not only will eventually access the GlobalConfig singleton, but also needs the getSiteLocation() method to return a useful value, and so on. There is no flexibility to use polymorphism and swap implementations depending on the situation, making the code less reusable.The OrderProcessor algorithm is actually general enough that it doesn’t care exactly how VAT is calculated, but this doesn’t matter since the wiring up of the object graph is intermixed with the business logic. So there is no easy way to change the wiring without also risking inadvertent change to the business logic, and if we would want to launch sites in for instance African or Asian countries with different rules, we might be in trouble. A weaker argument, or at least one I am less sure of, is: because the object graph contains all the possible execution paths in the application, automated functional testing is nearly impossible. Even for this small, simple example, most of the graph isn’t in fact touched by a particular use case. 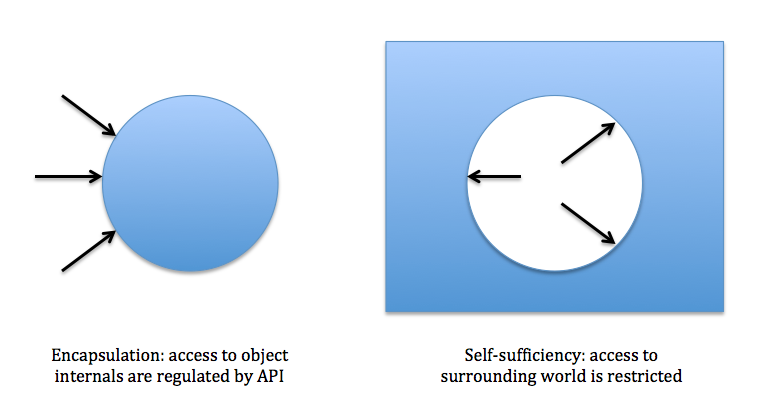 Countering those problems is a large part of the rationale for using Dependency Injection. Here’s what an implementation could look like if Dependency Injection is used. Since you can now instantiate single nodes in the object graph, and inject mock objects as collaborators, every node (class) is testable in isolation. Since the wiring logic is separated from the business logic, the business logic classes get a clearer purpose (business logic only, no wiring) and are therefore simpler and more reusable. Since the wiring logic is separated from the business logic, wiring is defined in a single place. You can look in the wiring code or configuration and see what your runtime object graph will look like. At the application level, there is a single object graph with objects that are wired together in the same way that needs to handle every use case. Since object interactions are frozen at startup time, objects need conditional logic (not well described in this example, I’m afraid) to deal with variations. This complicates the code and means that any single use case will most likely touch only a small fragment of the execution paths in the graph. Since in a real system, the single object graph to rule them all will be very large, functional testing – testing of the wiring and of object interactions in that particular configuration – is still hard or impossible. There’s too much indirection – note that the VatCalculator and VAT interfaces define what is essentially the same method. This is where the use-case specific context idea from DCI comes to the rescue. Note that dependency injection is being used to instantiate the contexts as well, and that it is possible to mix ‘normal’ static object graphs with dynamic, DCI-style graphs. In fact, I’m pretty sure the contexts should be part of a static graph of objects wired using traditional DI. Less indirection in the business logic because we don’t need to make up our minds about which path to take – note that the VatCalculator interface and implementation are gone; their only reason for existing was to select the correct implementation of VAT. Simpler and clearer business logic is great. The object graph is tight, every object in the graph is actually used in the use case. Since the object graphs for each use case contain subsets of all the objects in the application, it should be easier to create automated functional tests that actually cover a large part of the object graph. The main disadvantage I can see without having tested this in practice is that the wiring logic is now complex, which is normally a no-no (see for instance DIY-DI). There might also be quite a lot of contexts, depending on how many and how different the use cases are. On the other hand, it’s not more complex than any other code you write, and it is simple to increase your confidence in it through unit testing – which is something that is hard with for instance wiring done using traditional Spring config files. So maybe that’s not such a big deal. So separating out the logic for wiring up your application from the business logic has the advantage of simplifying the business logic by making it more targeted, and of making the business logic more reusable by removing use-case-specific conditional logic and/or indirection from it. It also clarifies the program structure by making it specific to a use case and explicitly defined, either dynamically in contexts or statically in DI configuration files or code. Good stuff! The second thing I understood came from watching Trygve Reenskaug’s talk at Øredev last year. He demoed the Interactions perspective in BabyIDE, and showed how the roles in the arrows example interact. That view was pretty eye-opening for me (it’s about 1h 10mins into the talk), because it showed how you could extract the code that objects run to execute a distributed algorithm and look at only that code in isolation from other code in the objects. So the roles defined in a particular context are tightly tied in with each other, making up a specific distributed algorithm. Looking at that code separately from the actual objects that will execute it at runtime means you can highlight the distributed algorithm and make it readable. So, clearly, if you want to separate an algorithm into pieces that should be executed by different objects without a central controlling object, injecting algorithms into objects gives you an advantage over injecting objects into an algorithm. Of course, the example algorithm from the talk is pretty trivial and could equally well be implemented with a central controlling object that draws arrows between the shapes that play the roles. Such an algorithm would also be even easier to overview than the fragmented one in the example, but that observation may not always be true. The difficult thing about architecture is that you have to see how it works in a large system before you know if it is good or not – small systems always look neat. So with DCI proper, you can do things you can’t with DCI/DI – it is more powerful. But without an IDE that can extract related roles and highlight their interactions, I think that understanding a system with many different contexts and sets of interacting roles could get very complex. I guess I’m not entirely sure that the freedom to more easily distribute algorithm pieces to different objects is an unequivocally good thing in terms of writing code that is simple. And simple is incredibly important. You can do it even in a language that doesn’t allow dynamically adding/removing code to objects. Dynamically changing which code an object has access to feels like it may be an area that contains certain pitfalls, not least from a concurrency perspective. We’re having enough trouble thinking about concurrency as it is, and adding “which code can I execute right now” to an object’s mutable state seems like it could potentially open a can of worms. I am still not completely sure that I am right about DI being a worthy substitute for class composition in DCI, but I have increased my confidence that it is. And anyway, it probably doesn’t matter too much to me personally, since, using dynamic, context-based DI looks like an extremely promising technique compared to the static DI that I am using today. I really feel like trying DCI/DI out in a larger context to see if it keeps its promises, but I am less comfortable about DCI proper due to the technical and conceptual risks involved in dynamically injecting code into objects.